Southside Waterjet i London, have had an amazing start since their formation three years ago- thanks to their creativity and their knowledge in stone-cutting. 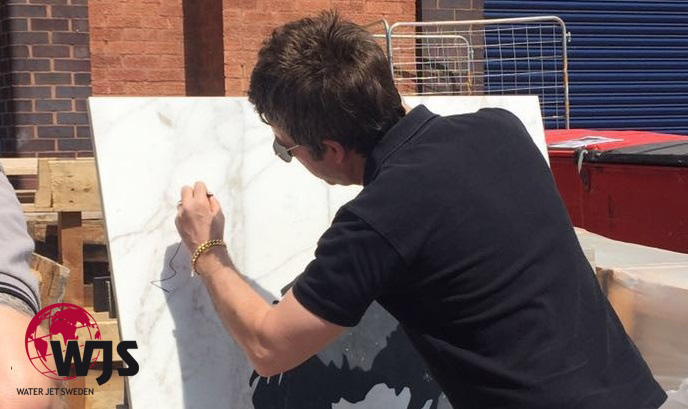 They managed to catch the popstar Noel Gallagher’s attention with an astounding piece of art in travertine and granite, a portrait of the former Oasis-star. Noel – who turned out to be just around the corner from Southside – noticed the artwork and popped by sign the creation, personally. A good example of great PR and genuine craftmanship.